So what is this game with the funny name?? Its a paddle sport created for a wide range of ages, athletic abilities and fitness levels.. Played on a badminton size court and can be played outdoors or indoors. The rules are simple and the game is easy for beginners to learn, ideally suited to seniors who want some fun exercise and social interaction or teenagers who are not really "sporty" For those who are ex Tennis, Squash or Badminton players, Pickleball is easier on your body but can still develop into a quick, fast-paced, competitive game. Pickleball has many health benefits as well, such as increased mood and overall mental health, you burn calories, and fewer injuries occur due to the low-impact nature of the game. Pickleball specifically works on balance and agility, while offering the same benefits of other regular exercise such as reducing your risk of heart attack and chronic disease, toning your muscles and increasing your energy. 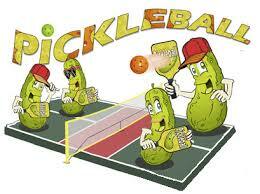 “The best thing about Pickleball is that it provides socialization and activity at the same time. Played as doubles, singles and even triples. Played at the War Memorial Hall - River Terrace - Waipukurau from 11am to 1pm every Tuesday $5 for hall hirage - all you need is some court shoes - everything else is supplied - come & have some FUN !